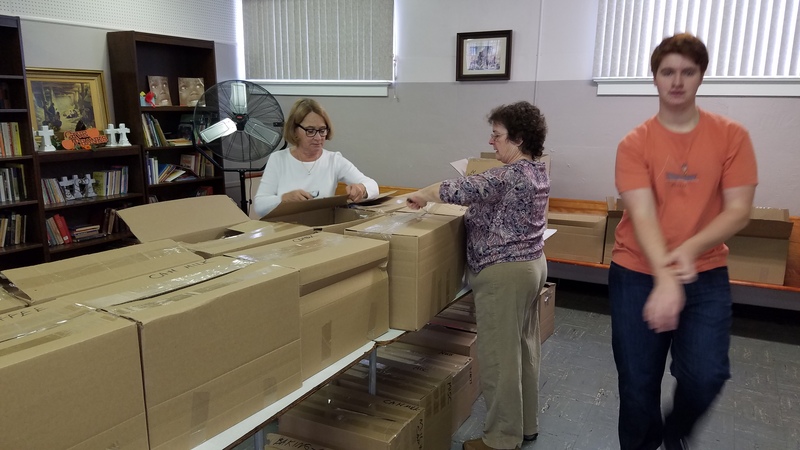 Volunteers at the Star Fish Food Pantry packaged Christmas dinners for 160 families on Thursday, December 21 at 9:00 a.m. at the Covenant United Methodist Church in Plainfield. 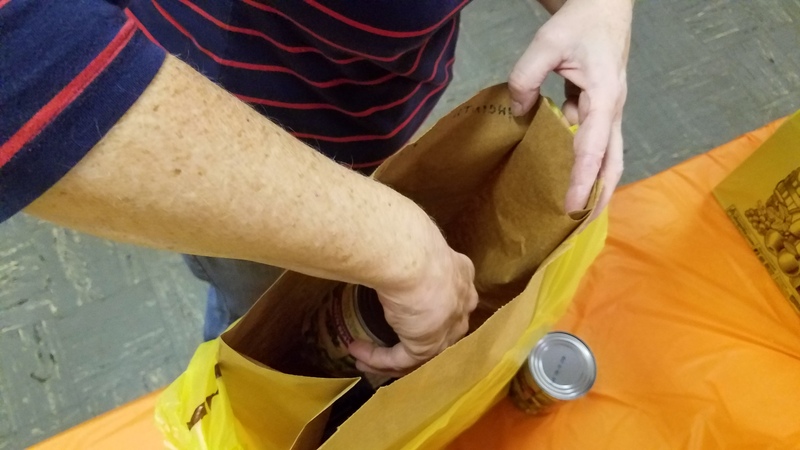 Our grateful Partner Agencies picked up the meals, with chickens or turkeys (depending on size of family), vegetables, potato mix, stuffing, mac n cheese, rolls, margarine, gravy, cranberry sauce, fruit - enough for a complete holiday dinner. This is one of the three major holiday meals that we present - Thanksgiving, Christmas, and Easter. Since Easter is right around the corner, and if you'd like to help, click here to send us an email for more information and details. Make a stop at your favorite grocery and pick up some of the items on our "Shopping List" page. We always need everything, even with recent huge donation from Faith Lutheran Church in New Providence and others. Or you can go to our "Donate" page and make a secure donation through PayPal. It's that easy to help a family in need. Valentine's Day isn't just for lovers, you know? 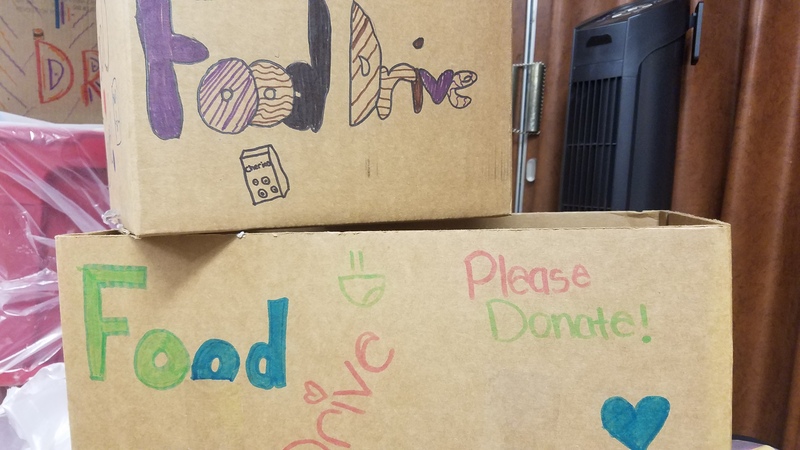 The fourth grade at Woodland School decided to use Valentine's Day as a service project to help meet the school's goal of addressing hunger in the area. Mrs. Jamie Perry and the other fourth grade teachers led their students in collecting tuna, pasta (including some Nice! Spaghetti), and vegetables, with each of the three classrooms assigned one item. This helped assure that a nice balance would be achieved with not too much of one item and only a little of another. The collection was a great success, but now the question became "What to do with this food?" 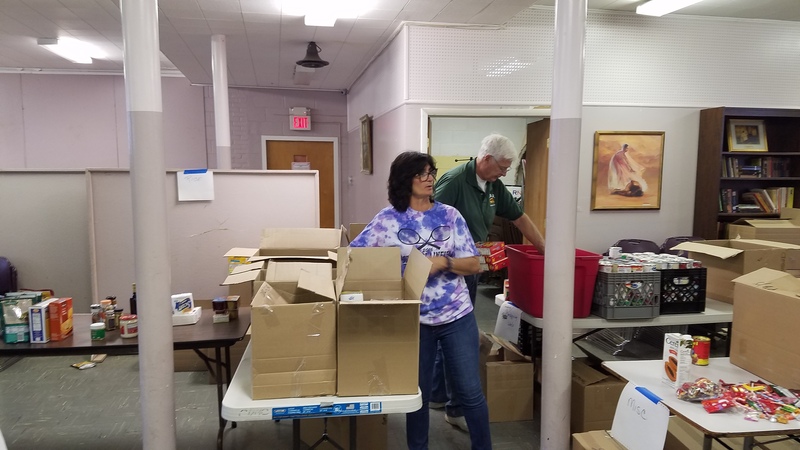 Fortunately, Mrs. Perry had learned of Star Fish Food Pantry through her church, Our Lady of Lourdes, and their support for our pantry. Mrs. Perry contacted us and two of our volunteers gladly drove up to Woodland School to meet her and Principal Jeff Heaney and to collect the food. They explained about how we operate; who gets our food and how; our sources of food, such as annual Thanksgiving deliveries by our generous friends at St. Andrews and Faith Lutheran in New Providence and others listed in a later story on this page; drop-offs by individuals; regular collections by local chur ches (like hers); and purchases from the Central Jersey Food Bank in Hillside. The volunteers thanked Mrs. Perry and asked her to please express that thanks to the other teachers and especially the students who brought in the food. We are so grateful! Star Fish has been blessed to know and benefit from many individuals and groups who find it in their hearts to help us meet our mission. Some of these people work every week, volunteering their time and talent to help assure that people in need have food to eat. 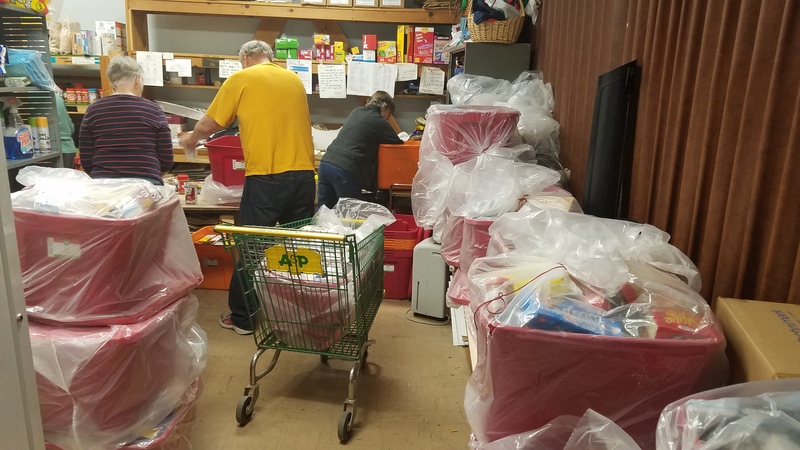 Others work on projects that benefit the Food Pantry with supplies and re-supplies, some of them year in and year out. We express our appreciation for all of them, and offer this news about the benefits that we received this past Thanksgiving. 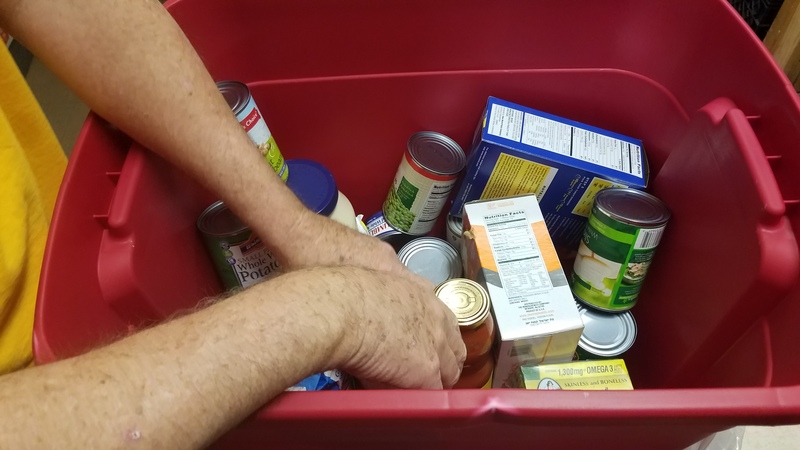 Our friends at Faith Lutheran Church and at St. Andrew's Church, both in New Providence, bring us food and supplies at Thanksgiving time that helps us help others into the following Spring. 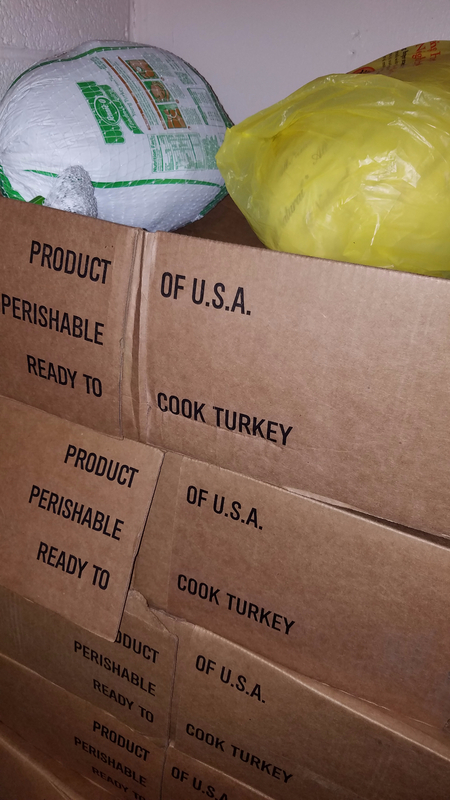 This year was no exception, providing us with hundreds of boxes of food and turkeys for our Thanksgiving Meals Project. 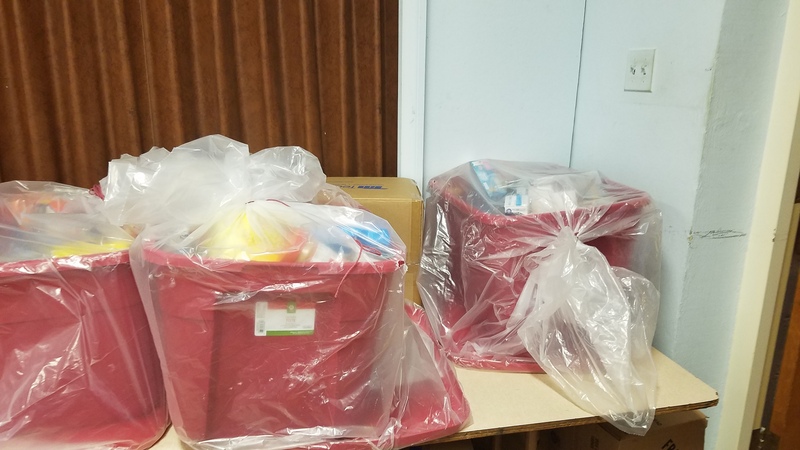 They were joined by College Achieve Charter School in Plainfield/North Plainfield, Food for Thought in Scotch Plains, Crescent Avenue Presbyterian Church in Plainfield, and by many others whose donations help us with our mission. 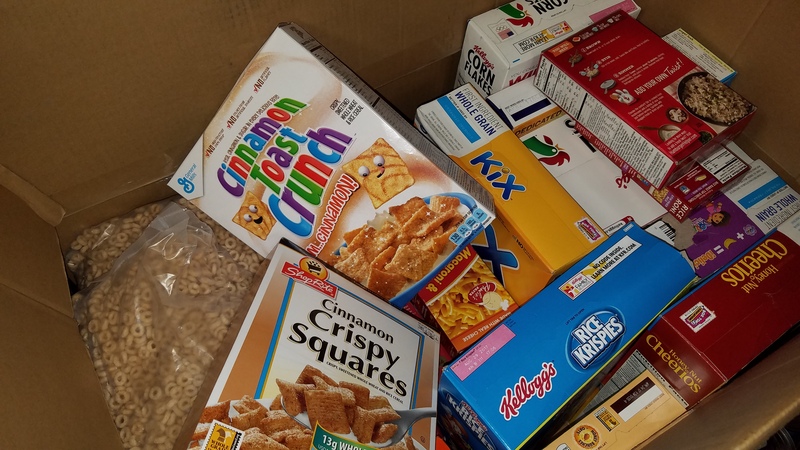 On Saturday November 19th 528 boxes of food – worth an estimated $37,000 – was collected by local Scout Troops and sorted/packed at Faith Lutheran Church. 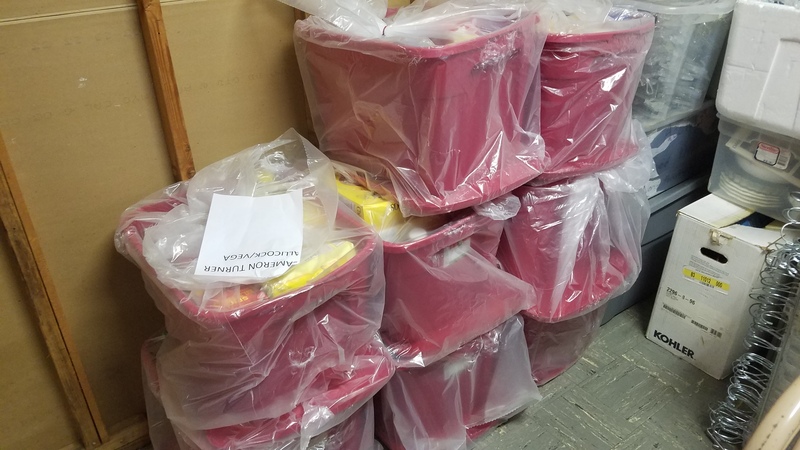 Of these, 150 boxes of food were handed out over the weekend by Community Service Association of New Providence to 38 local families in need. 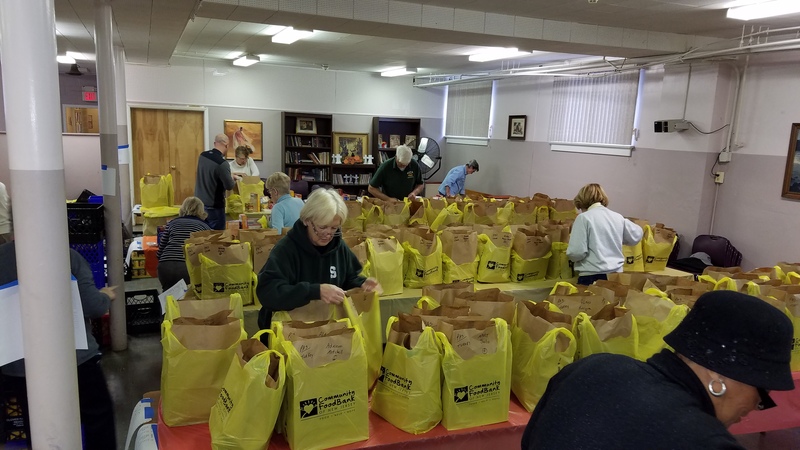 On Saturday November 26th, the remainder of the food was delivered to the Star Fish Food Pantry, an interfaith pantry in Plainfield. We received an overwhelmingly generous amount of food donated by the family of faith during our month-long collection in the narthex. 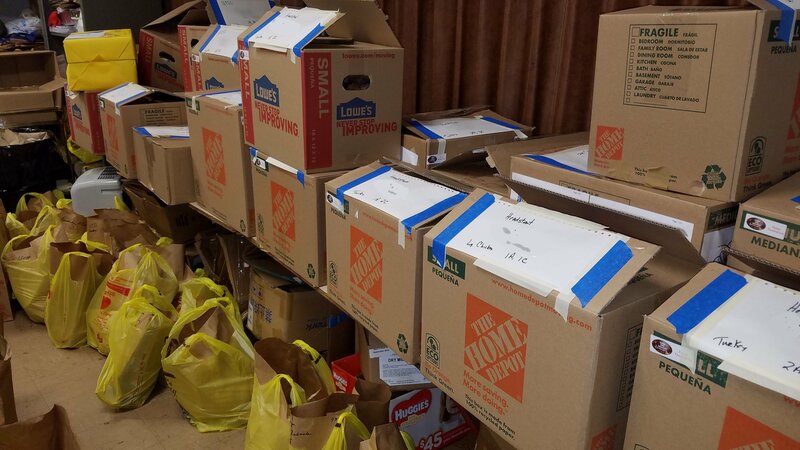 In addition, we received food collected by Lantern Hill and Weichert Realtors in Summit. 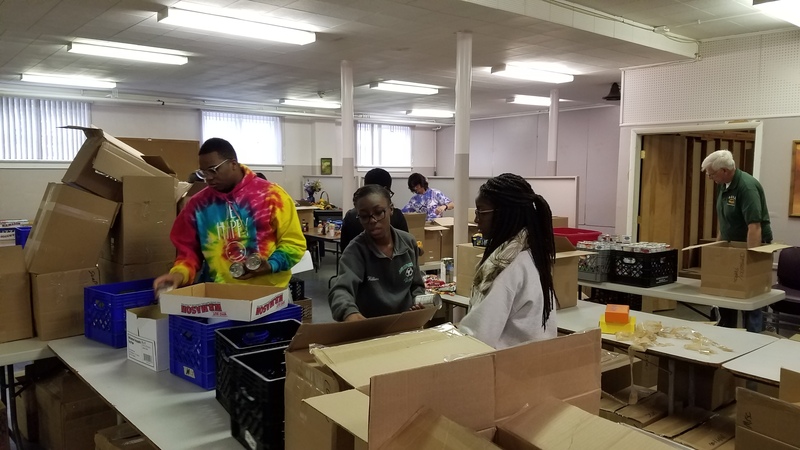 VOLUNTEERS: This year, over 160 volunteers sorted and packed thousands of dollars worth of food in just about four hours. Of these volunteers, 96 came from the Family of Faith; the others were from various community groups including the CSA. 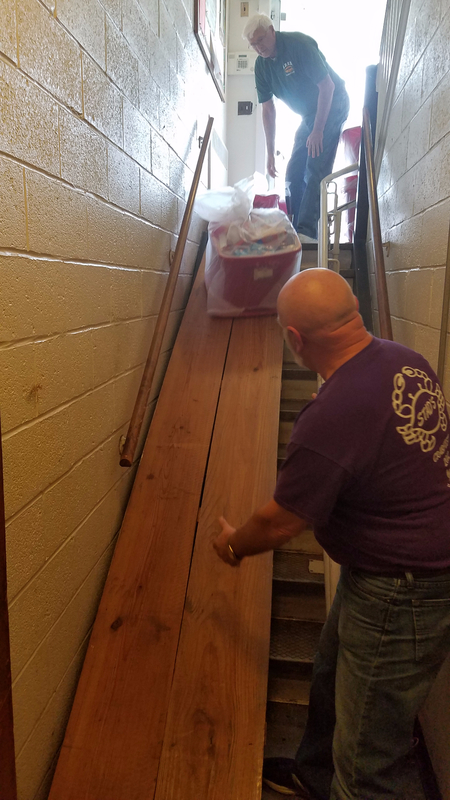 Boy Scout Troop 68 from Berkeley Heights under the leadership of Jim Kwan joined our Pack & Sort day and assisted with unloading cars and moving the bags of food down the long hallway to FHN for sorting. TRANSPORTATION VOLUNTEERS: This year we had over 27 volunteers who helped to transport over 388 boxes of food to the Star Fish Food Pantry. We used one truck driven by Chris Melhuish. This year our new neighbors Lantern Hill donated the cost of the truck rental for our Transport Day. 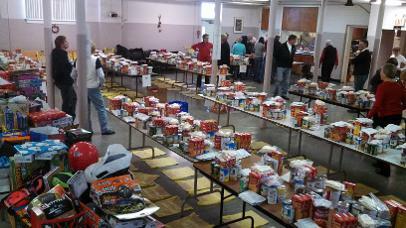 Many volunteers from the pantry and the rollers aided our delivery efforts. We confirmed our donation will stock their shelves until next summer. College Achieve Charter School is a new school located at the St. Bernard Parish in Plainfield. Our new friends undertook a project to assist Star Fish Food Pantry with food donations from their school classrooms. Boxes were decorated and placed in the classrooms for students to fill, and fill they did! 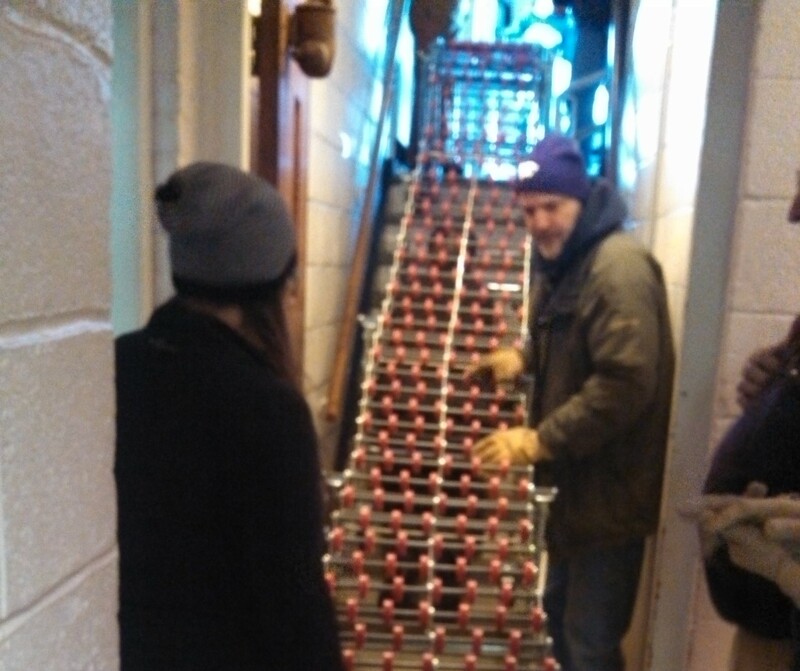 We were blessed to have Mary Greely of College Achieve deliver the food and help bring it down to the Pantry. As show in the photos, this was both a lesson in giving and a fun project for the students. We thank them sincerely for their kindness and generosity. 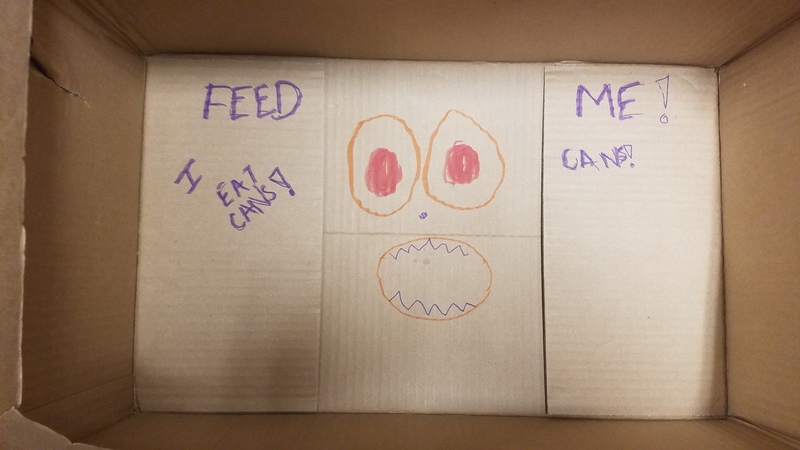 Crescent Avenue Presbyterian Church runs their own feeding program every week, but they still found it in their hearts to collect food for our pantry (photo left). 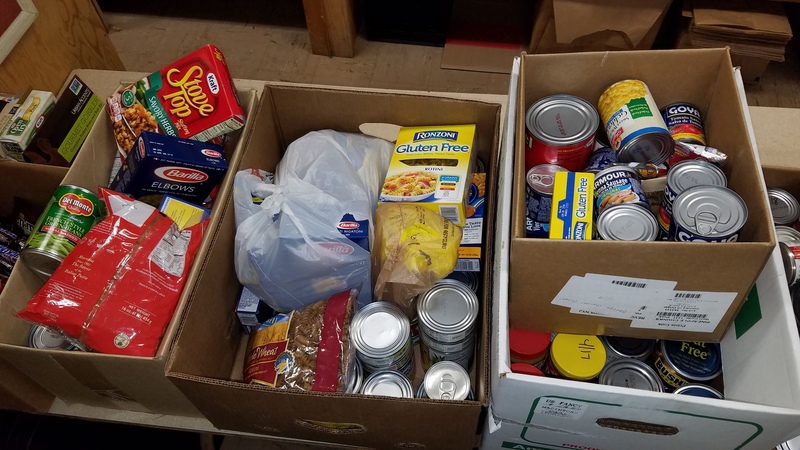 Food for Thought in Scotch Plains generously donated some of the food that they collected in the period leading up to Thanksgiving. They boxed the food and labeled it for family size, making our job so much easier. 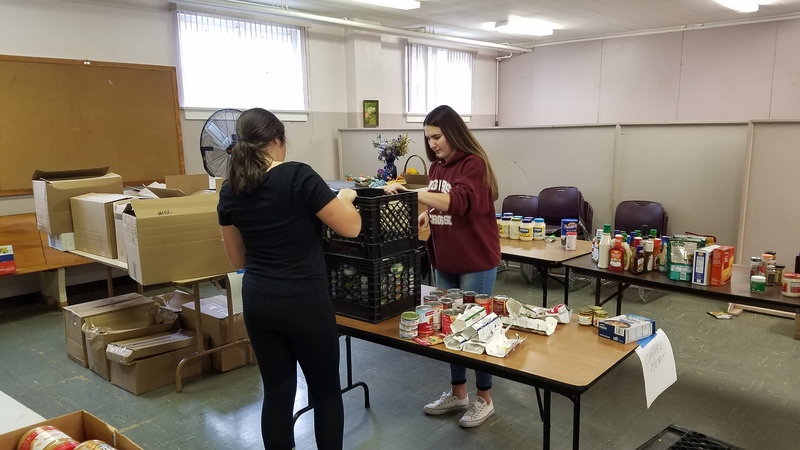 Union Catholic High School and Immaculate Heart of Mary Church in Scotch Plains partnered again this year to collect food for our Pantry. 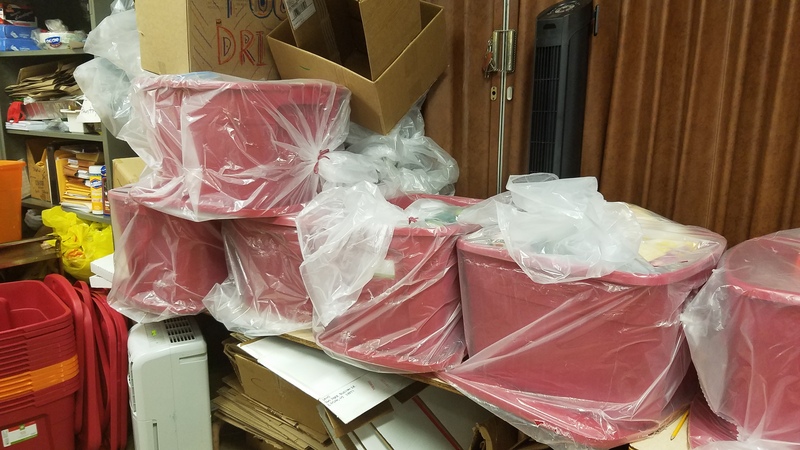 Amazingly, when we went to pick up the donated food, it was all packed in giant totes that were enclosed in plastic bags for protection against the weather. Between 2,000 and 2,500 pounds of food were donated this year, a remarkable amount and so greatly appreciated! St. Andrews Church andTURKEYS, TURKEYS, TURKEYS!! What's Thanksgiving without turkey? Well, we didn't have to worry about that, thanks to St. Andrew's Church in New Providence (donated 40 turkeys), Division of Developmental Disabilities in Plainfield (donated four turkeys and food and money for our purchases as needed), and Union Catholic High School and Immaculate Heart of Mary Church (donated 31 turkeys in addition to the other totes of food). 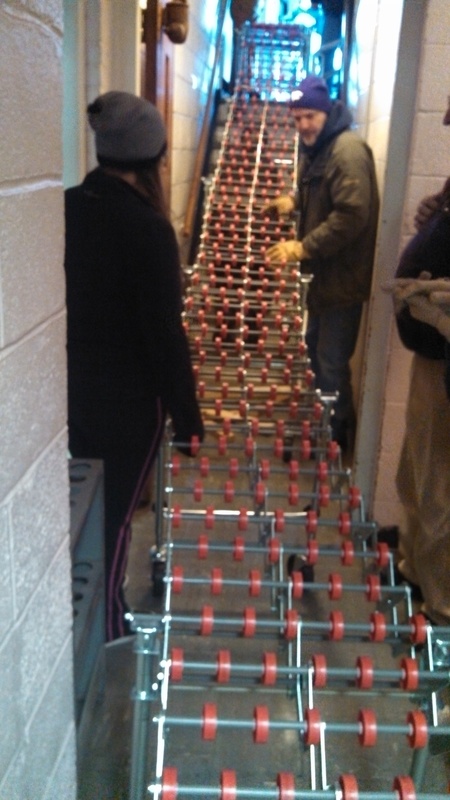 This and other food was diligently packaged for over 150 families to help them enjoy a bountiful Thanksgiving dinner. 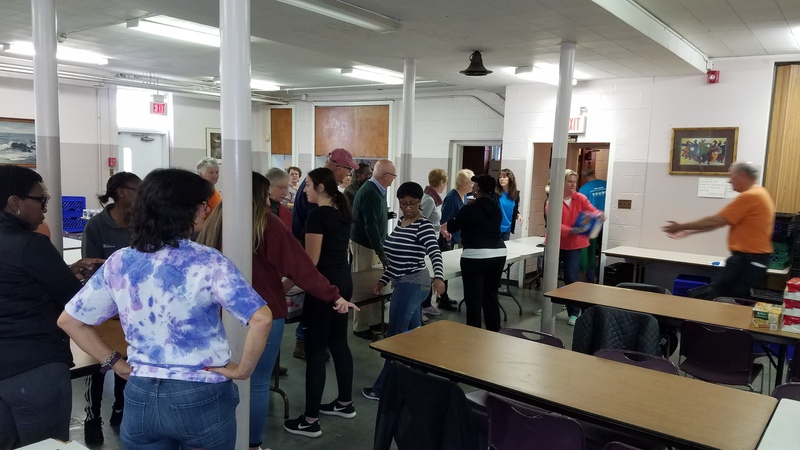 Thank you to all of our supporters and donors, our volunteer workers, including Girl Scouts and their leader from South Plainfield, and all those who helped with our Thanksgiving Meal Project and our post-Thanksgiving donation sorting and packing project. You are, each one of you, a miracle! 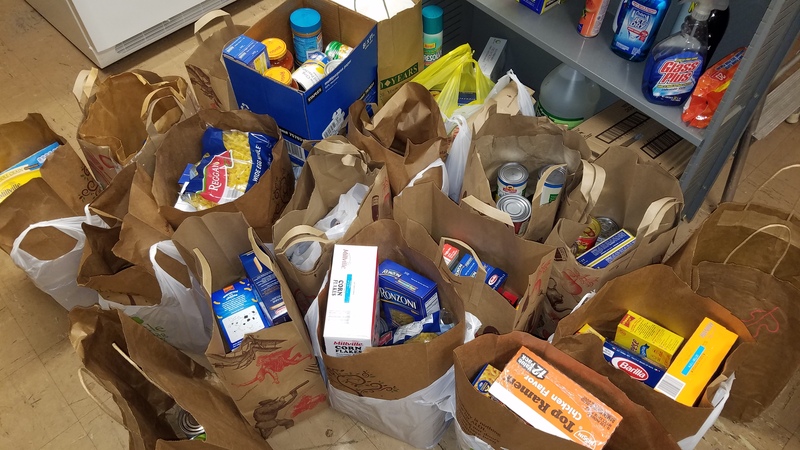 We thank the Youth and Outreach Group for the Scotch Plains church for their donation of both food and gifts for the 2015 Christmas Project here at the Food Pantry. This was the first donation by the church and was well-received and put to good use immediately. We always appreciate any donation, of course, but the combination of food items and gifts was just terrific! 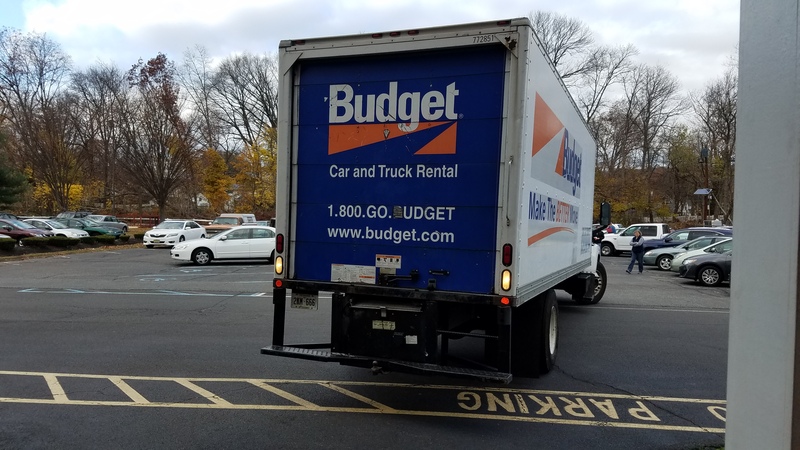 Imagine our surprise when we drove up to Immaculate Conception Church in Scotch Plains and found over 800 pounds of food waiting for pickup in 2015?! We knew there would be "some" food there, but the amount of foodand the enthusiasm of the students were amazing. Everything we need in the pantry was contained in large plastic storage tubs, protected in plastic bags (see photo). And thanks to the strong young students, we only supervised the loading of two full-size SUVs and one full-size pickup truck. Our most profound thanks to all who contributed - truly a blessing! We continue to serve our clients through the generosity of individuals, groups, area churches and their congregations, and other donors. 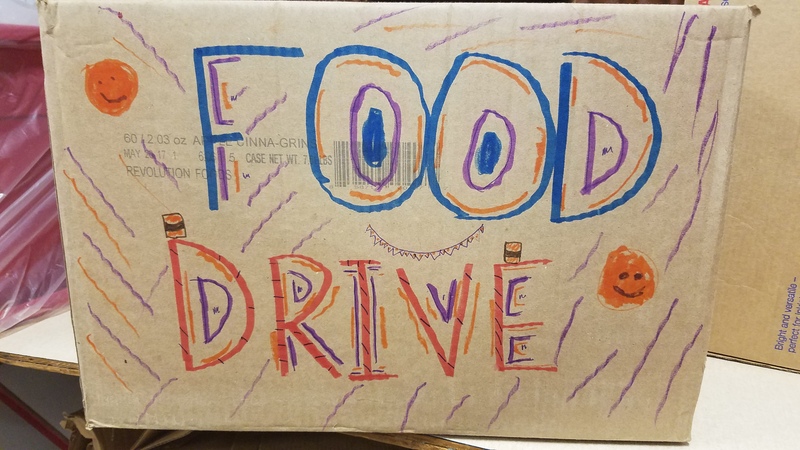 Our food supplies are low, causing us to use our monetary donations to purchase food to supplement that which is dropped off at the Pantry. 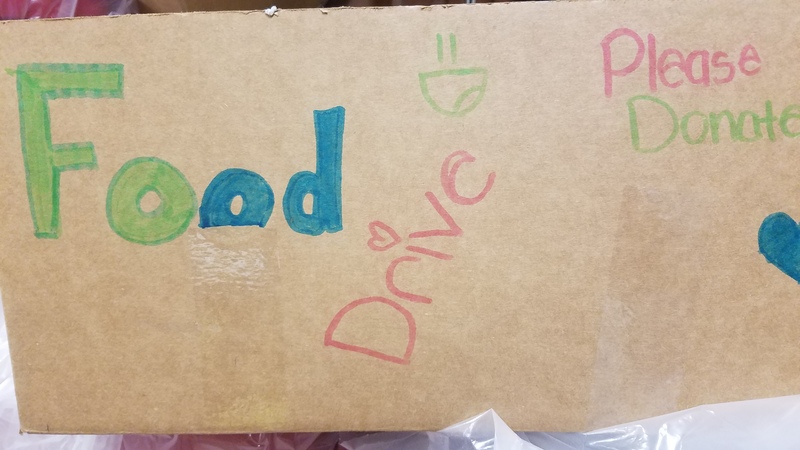 If you would like to donate food, see our Shopping List page for the items we need and our Contact Us page to make arrangements to get the food to us at your convenience (we pick up, too!). We recently received two new freezers to replace old, non-working "space-takers" that were of no value. These new freezers were a gift from Wilson Memorial Church in Watchung, to whom we are extremely grateful. The freezers are particularly valuable for two reasons: (1) one of our volunteers brings donated bread each week which is placed in a freezer; and (2) our choice of meats through the Community Food Bank of NJ is such that we need more freezer capacity to properly store the meat when we receive it. A third freezer recently "died" and, along with it, we lost frozen chicken. We are hoping to replace that one soon. 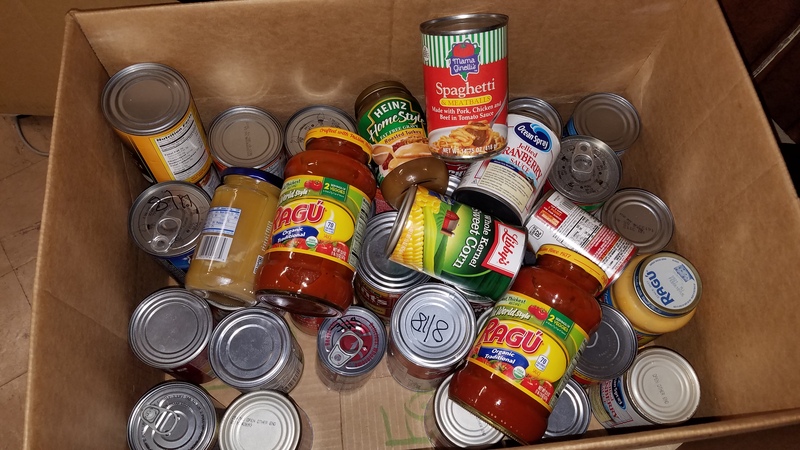 Speaking of the Community Food Bank, our Treasurer reports that, after one year of participating in the Food Bank, we purchased 21,638 pounds of food at a cost of $10,438, or just over $.50/pound. This a great savings for our budget while still providing our clients with quality food, including better cuts and quality of meat. Our holiday meal preparation is beginning. One of our "needs" is for people who can help bake cakes. We give every family a single-layer cake as their dessert with their holiday meal items. We will supply the disposable cake pans and arrange for pickup of the cakes. Anyone wishing to volunteer (Thanksgiving, Christmas, and then Easter) should use our Contact Us page. 2014 shows a 37.2% increase in families served over 2013. The total number of people has also grown by 53.9%. The biggest increase has been in the number of children served. 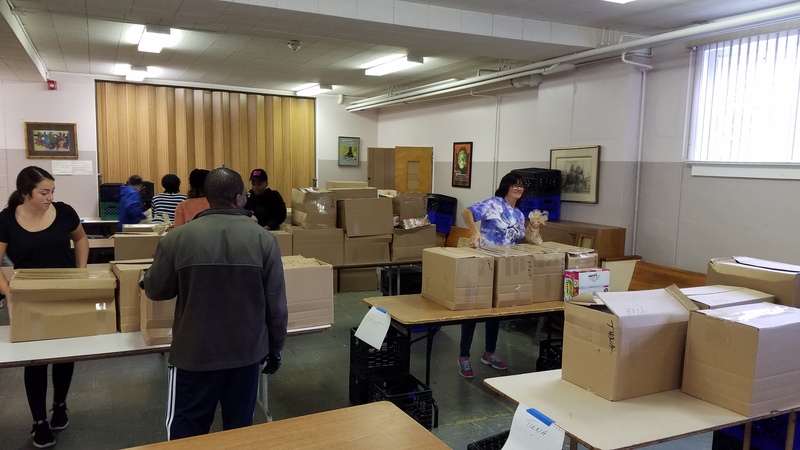 We joined with the Community Food Bank of New Jersey, located in Hillside, in mid-September, 2014. The table below compares the September through December period in 2014 with CFBNJ to the same period in 2013 without their help. The total number of people served in this period is up by 67.4% with the greatest driver being children with a growth of 90%. Our relationship with CFBNJ in Hillside has brought us some considerable savings since September 2014, the greatest of which being with our purchase of meat. At Hillside, we qualify to purchase 400 lbs. of meat a month for a cost of $72.00, or 18 cents per pound. In the past, our purchase of meat would average $490.00 for 200 pounds, or $2.45 per pound. We are now distributing a greater variety and higher quantity of meats to our clients at a considerably lesser cost. Starting in 2015, we hope to see some of these types of savings reflected in our Holiday Meal Distribution as well. Over the last 4 months of 2014, we averaged 125 families served as compared to 88 families a month in the last 4 months of 2013. Likewise, since joining with CFBNJ, the number of people served per month averages 417 compared with 250 servedduring the same period of 2013. 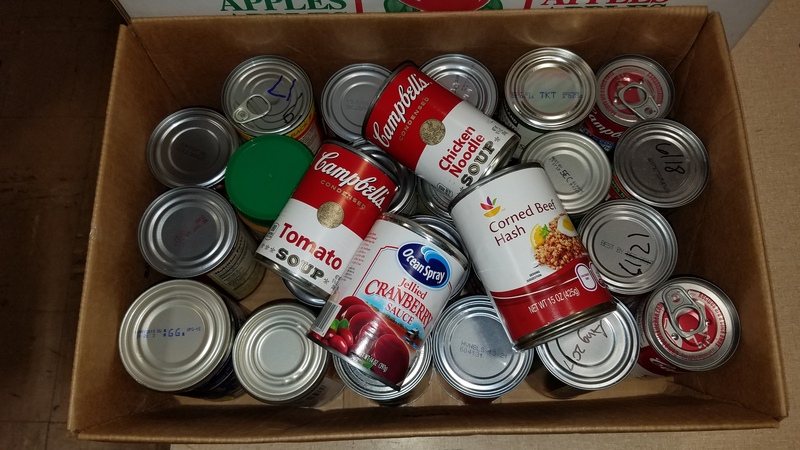 For the second year in a row, the students at the Cornerstone Day School in Mountainside collected and delivered food just in time for 2014Thanksgiving! Mac 'n' cheese, canned vegetables and soups, pasta...all the foods that we use every week were in the many bags and boxes that the Cornerstone folks delivered. We are so grateful, not only for the donation of food, but for the social concern expressed by the students' and the staff's generosity. Thank you!! What a great day! 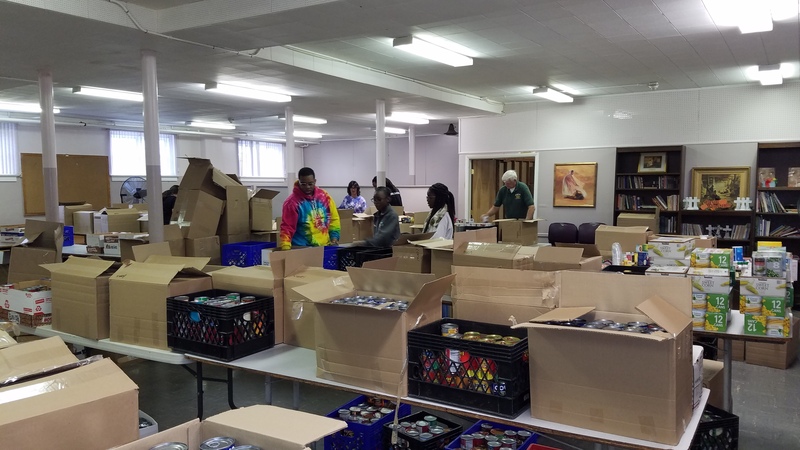 On December 20, 2013, approximately 25 people helped pack dinner bags for 160 families. We also gave out donated toys and other gifts for the children of these families. Dinners of ham, yams, corn, green beans, mac and cheese, pineapple, tea and cake were packaged and ready to go by 11:00 a.m. "Thank you" to all of the volunteers, both those who've been there for years and the new people who came out for the first time. We appreciate all of you for your help and generosity. We are giving thanks to the parishioners of St. Andrew's Church for their donation of 24 turkeys for our Thanksgiving Dinner program. 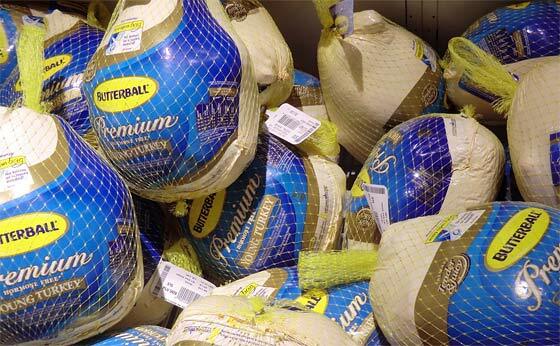 We will distribute the turkeys to some of the 170 families we will help with full, Thanksgiving meals this year. "For I was hungry and you gave me food, I was thirsty and you gave me drink..."